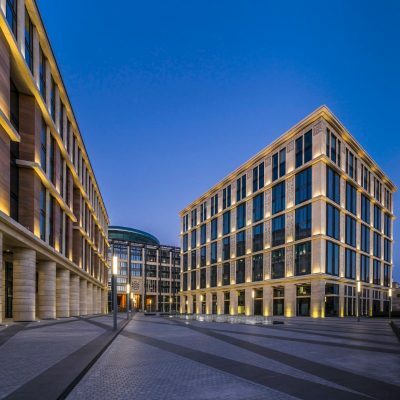 Located in the city centre of Saint Petersburg, the new administrative and business district Nevskaya Ratusha is characterized by a high variety of different uses comprising a government building, business-centers, hotels, commercial und public spaces. Its structure is very clear: Along both sides of the plot two rows of buildings of simple geometry point towards the city hall representing the heart of the ensemble. By now, two business-centers and the city hall have been completed. Equal building heights, scales and interspaces altogether create a harmonic pattern connecting with the surroundings. Each building offers a two storey-high arcade towards the square as covered walk. The façade is mainly clad in bright Travertino Romano. 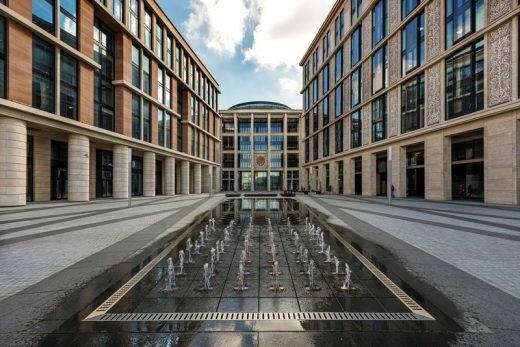 Additionally further natural stones were chosen for particular façade details of both existing business-centres as well as for the emerging buildings. With its 55 meters height and its expressive appearance, the city hall, as the seat of public administrative bodies, became an architectural dominant. 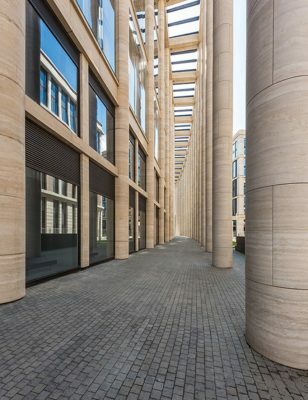 Towards the street and the square, impressive 30 meter-high columns create colonnades together with beams and glazing. In Addition, all fronts are decorated with semi-columns. 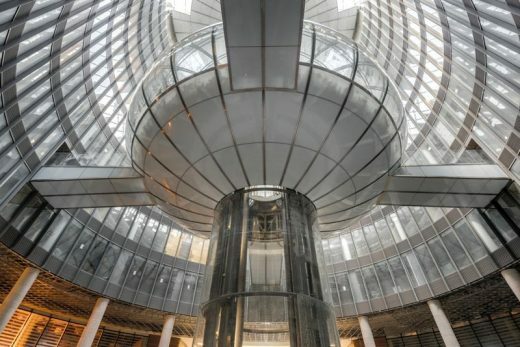 The central lobby is the building’s core, uniting all public spaces on the ground floor and lit by a cylindric atrium. Also, the lens-shaped futuristic glass dome is accessible to the public. A cylindrical glass elevator for up to 25 persons transports the visitors to the observation desk with a panoramic view of the city; there, an exhibition shows different design stages of the Ratusha ensemble. The glass parts of the façades are made as a double-skin construction having two glass layers of different textures. Such combination provides a unique solution in terms of energy efficiency and acoustic insulation. The outer layer consists of six meter high multilayered tempered safety-glass giving the façade a light and vivid appearance. The dome is constructed of 12 curvilinear steel frames varying from 1.5 meters at the base to 40 centimeters at the top of the dome. 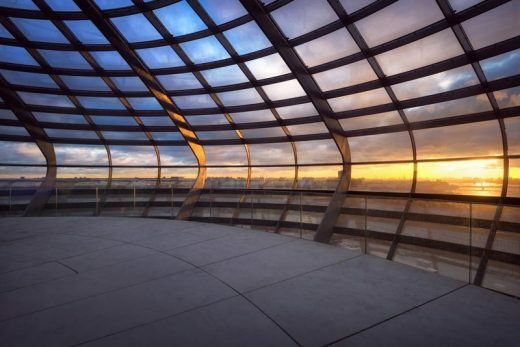 To ensure best possible view conditions the observation deck glazing was made of white glass with minimum pigmenation. Additionally the top part of the glazing has a solar-protection glass layer. The distinctive elliptical form of the dome has already become an important point of the city panorama and a symbol of the new neighborhood.